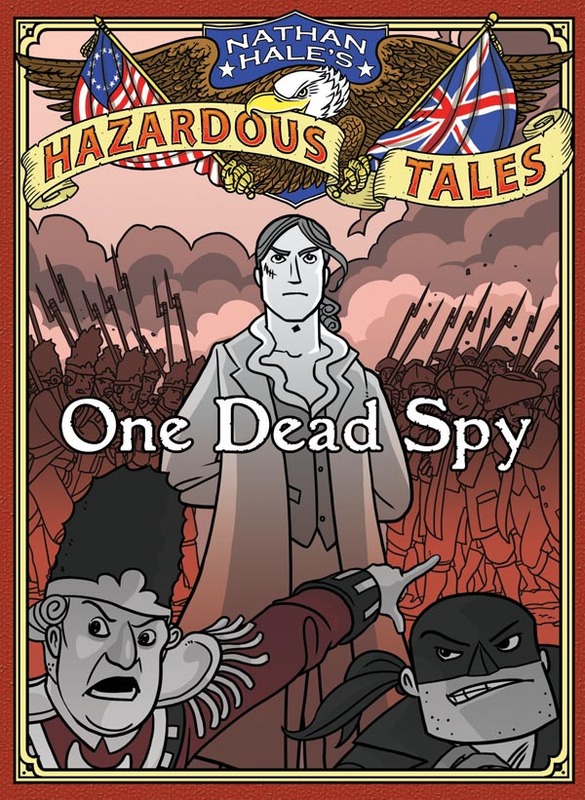 Review – Nathan Hale’s Hazardous Tales One Dead Spy and Big Bad Ironclad! Educational comics and graphic novels is a growing genre that’s becoming more popular not just in academia, but also for every day readers. Nathan Hale’s Hazardous Tales: One Dead Spy and Nathan Hale’s Hazardous Tales: Big Bad Ironclad! are two of the latest examples delving into our rich American History. With story and art by Nathan Hale, One Dead Spy tells the story of Revolutionary War spy Nathan Hale (yes I was confused as the writer has the name name of the subject) while Big Bad Ironclad! skips ahead in time to the Civil War and the race between the North and South for supremacy in the waters. Both digest sized graphic novels are great for kids learning about American history or adults wanting to go back and brush up on what they might not remember from school. The most important thing though is they’ll be entertained while learning. It’s a novel concept but key. Hale (again the creator, not the spy) fills both books with solid writing, creating a flow to the story that keeps you engaged and making the reading go with a breeze. The art too helps a lot with a cartoonish quality that kids will enjoy as well as adults. It’s seems like a rare (but becoming more common) case that a comic or graphic novel can be entertaining and educational and Nathan Hale achieves both. And it’s great to be able to read something that’s entertaining for both kids and adults (and educational)! It’s no-brainer to recommend both as they’re the same quality. If you have a kid in school, just getting started on American history, these are absolute buys to get the kid excited and also educated. 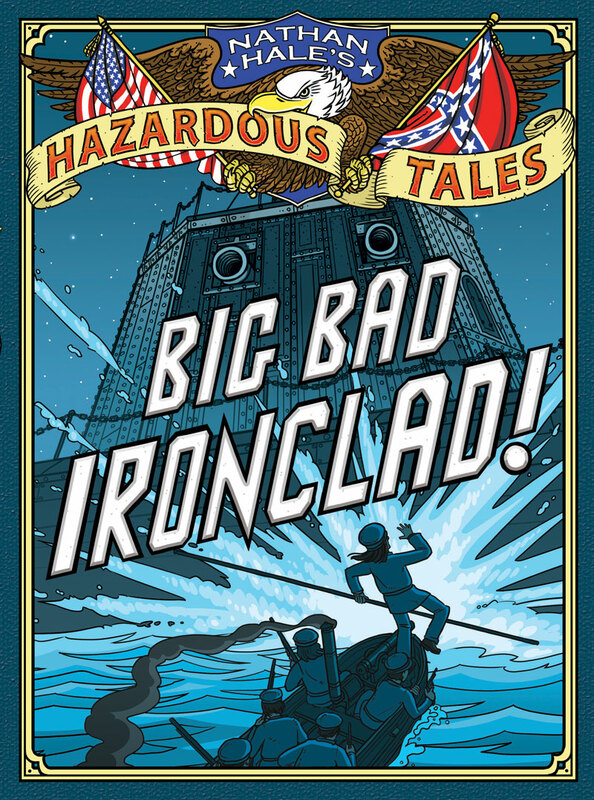 Nathan Hale’s Hazardous Tales: Big Bad Ironclad! Abrams Books provided a FREE copy of both to Graphic Policy for review. Bethesda, Maryland; August 18, 2011 – The Small Press Expo (SPX), the preeminent showcase for the exhibition of independent comics, graphic novels and alternative political cartoons, is pleased to announce nominees for the fifteenth annual presentation of the Ignatz Awards, a celebration of outstanding achievement in comics and cartooning. SPX will be held Saturday, September 10 from 11AM to 7PM and Sunday, September 11, noon-6PM at The North Bethesda Marriott Convention Center in Bethesda, Maryland. Admission is $10 for a single day and $15 for both days. For further information on the Ignatz Awards, the nominees or to request an interview, please contact Warren Bernard at warren@spxpo.com. 5 Days until Diary of A Wimpy Kid The Ugly Truth goes on sale! 5 MILLION COPY FIRST PRINTING LEADS THE BIGGEST BOOK RELEASE OF THE YEAR ON TUESDAY, NOVEMBER 9. On Friday, November 5, Jeff Kinney will appear on CNN’s American Morning and CNBC’s Power Lunch. National advertising runs throughout the month on poptropica.com, cartoonetwork.com, in Times Square on the Toys R Us Geoffreytron (photo attached), and in trade and consumer press. Custom designed exterior store wraps are unveiled this week at Anderson’s Bookshop in Naperville, IL, (photos attached) and Children’s Book World in Haverford, PA. Unique promotional items, including purple character-shaped Wimpy Kid wrist bands, water bottles, oversized posters and standees, reproducible event kits and more, ship to more than 3,000 retailers and libraries across the country. Hundreds of authorless parties at retailers and libraries are planned. Jeff Kinney will tour for charity and store events in Dallas, Austin, Little Rock, Memphis, Nashville, Birmingham, San Diego, and New York. Visit www.wimpykid.com for exact stops. Photos of the Diary of a Wimpy Kid Macy’s Thanksgiving Day Parade Giant Helium Balloon will be released next week. From more than 14,000 entries received, on November 10, 2010, ABRAMS will announce the winner of a contest to bring a lucky fan and three friends or family to the 2010 Macy’s Thanksgiving Day Parade to sit in exclusive grandstand seating. Books in the core Wimpy Kid series by Jeff Kinney include Diary of a Wimpy Kid, Diary of a Wimpy Kid (2007): Rodrick Rules (2008), Diary of a Wimpy Kid: The Last Straw (2009), and Diary of a Wimpy Kid: Dog Days (2009). Jeff Kinney has also written and illustrated the Diary of a Wimpy Kid Do-It-Yourself Book (2007), and The Wimpy Kid Movie Diary (2010). The series is a fixture on the USA Today bestseller list, the first book in the series has remained in the top 150 for more than 170 weeks, and the Wall Street Journal, and Publishers Weekly bestseller lists. It has also remained consistently in the top spots on the New York Times lists since publication of the first book in the series. More than 42 million Diary of a Wimpy Kid books will be in print in the United States and Canada as of November 9, 2010. The books have been sold in more than 37 countries in 35 languages around the world. Published by Amulet Books, an imprint of ABRAMS, Kinney’s work has been widely credited for its ability to turn reluctant readers on to books. In 2010, the movie adaptation of Diary of a Wimpy Kid grossed more than $75 million worldwide in box office sales, the book series won a Nickelodeon Kids’ Choice Award, and books in the series won numerous awards voted on by students and teachers in schools around the globe. In 2009, Jeff Kinney was named one of TIME magazine’s most influential people in the world. A second movie, Diary of a Wimpy Kid: Rodrick Rules, will hit theaters in March 2011. About Amulet Books: Created in 2004 to specialize in books for middle grade and young adult readers alongside Abrams Books for Young Readers, which publishes books for readers up to age twelve, Amulet Books publishes bestselling and award-winning fiction and nonfiction. Amulet Books is an imprint of ABRAMS.